Find someone, who has a chronic health condition e.g., arthritis, asthma, CAD, COPD, diabetes, HIV, hypertension, etc. Imagine sensors that monitor body chemistry painlessly and connect to “the cloud”. 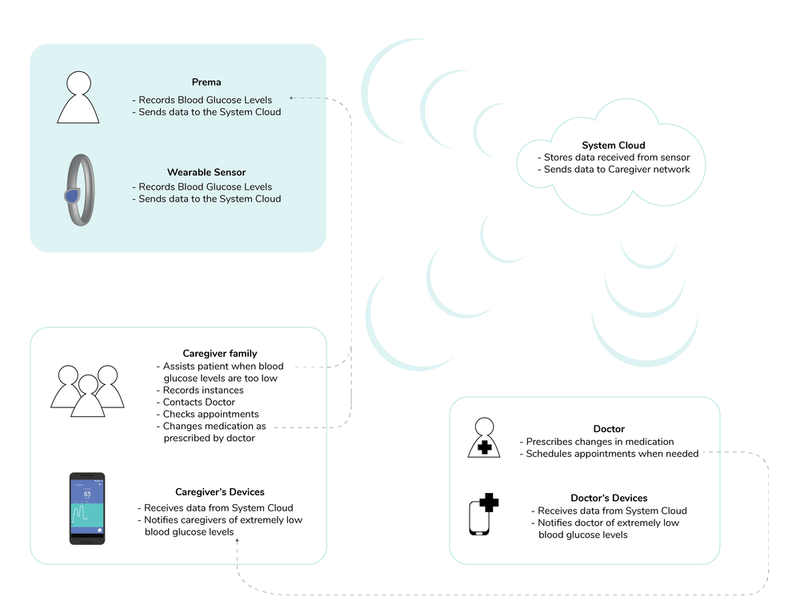 Imagine other cloud-connected devices that deliver therapies. Propose a system to help the person and caregivers better manage their wellbeing. Glucare was designed with Type II Diabetes patients in mind - particularly patients who are managing their diabetes well, but need caregivers in emergencies. 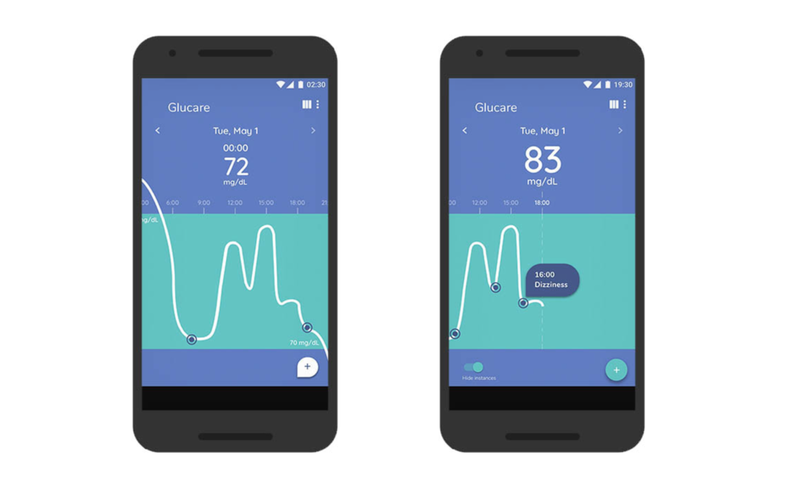 The service ecology offers keeps caregivers in the loop of the patients blood sugar levels, with the help of a mobile app, a non-invasive Continuous Glucose Monitor (CGM) wearable, and cloud-connected system. Type II Diabetes is the body’s inability to produce sufficient amount of insulin, causing the blood glucose levels to rise. Type II Diabetes is the most common form of diabetes. A quarter of the U.S. population aged ≥65 years has diabetes. Geriatric diabetes is associated with higher mortality rates, increased risk of institutionalization, and reduced functional status. Senior citizens managing diabetes are also at risk of acute and chronic microvascular and cardiovascular complications. Hypoglycemia, or low blood glucose levels, results in weakness, impaired vision, slurred speech as the glucose required for the brain’s normal processing is reduced. In a prolonged state this can even lead to seizures, coma, and very rarely death. Prema is my grandmother. She is 84 years old. A couple of months ago, she fainted and hit her head. Everyone at home was asleep. This was especially scary because Prema is a long-time diabetic. If my parents hadn’t been at home, it might have been too late and her hypoglycemia could’ve led to a coma. I wanted to see if there way to alerts my parents if Prema’s blood-glucose levels were too low, and possibly prevent future falls. Although this project is designed for my grandmother, it would scale to other diabetes patients in similar situations. Prema and Hemant celebrating their 65th Wedding Anniversary with ice-cream, my grandma’s favorite. In order to understand what causes diabetes and how it affects the human body, I conducted some online research. I then diagrammed various system maps to dive deeper into the details. I needed to understand what was unique about my grandmother’s situation. After interviewing Prema, Hemant and my mother, I realized that Prema has managed her diabetes and kept her sugar levels in check for more than 20 years. She adheres to a strict diet, and takes her medicine (Metformin) regularly. Although Prema diligently takes prescribed medication everyday and follows a strict diet prescribed by the doctor, she does not partake in any physical activity. Prema checks Blood Sugar Levels once a month instead of once a week; and hence reports only a quarter of the readings needed to the doctor. She feels concerned if her blood sugar levels are higher or lower than her average. She occasionally feels faint, light headed and weak if her meals are delayed, but does not communicate this to her caregivers. Her caregiver network is not able to support her wellbeing as they do not have accurate or timely contextual information. To address the lack of accurate and timely contextual information, I first assessed what information was crucial to this network. Prema needs to check her glucose levels every week, and her Doctor needs access to those readings in order to make appointments when needed. Her family on the other hand only needs to know if her blood sugar levels drop low enough for Prema to become hypoglycemic. Creating a conceptual model of this information was crucial to defining the wireframes. I proposed a non-invasive CGM-wearable for Prema. Since her diabetes is under control, and minor fluctuations cause her to worry, the wearable would monitor her blood sugar levels and send that data to her caregiver network - the Doctor and her family. It would alert them if her blood sugar levels dropped. However, for Prema, the wearable would be an aesthetic piece of jewelry - she could choose to activate notifications if she wants. This project was close to my heart because I was designing a service for someone I love. It put my systemic thinking to the test and resulted in something really simple. Although non-invasive CGM devices are being developed and sold, we tend to forget about the elderly population. I look forward to scaling this project by interviewing more senior citizens, reviewing the feasibility of the technology and refining the UI. Due to the short duration of this project, I focused on designing the key screens. 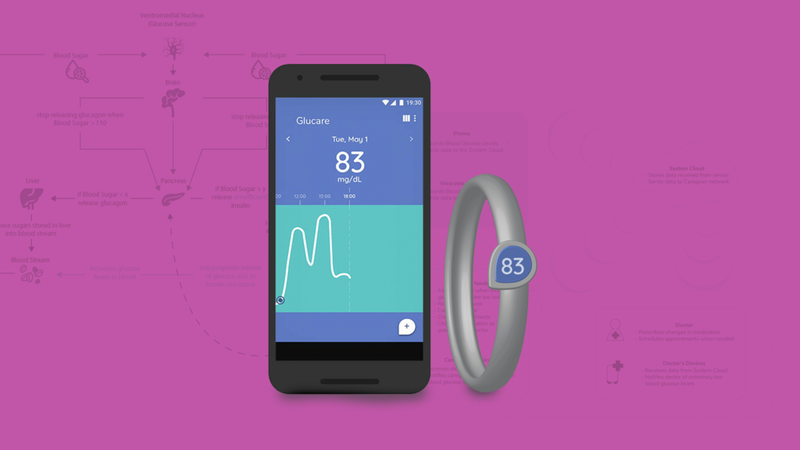 The next step for me would be to design the system for the Doctor and define key features of the wearable.